Modern Marriages: The Rise Of The Sugar Mama The joke used to be that some women went to college to get their M.R.S. — that is, a husband. But a study by the Pew Research Center finds that women today are more likely to marry men who have lower education levels and lower income levels than they do. The joke used to be that some women went to college to get their M.R.S. — that is, a husband. In sheer economic terms, marriage was long the best way for a woman to get ahead. But a study by the Pew Research Center finds that there's been a role reversal when it comes to men, women and the economics of marriage. The study compares marriages in 2007 with those in 1970, when few wives worked — and it's no wonder why. Until 1964, a woman could legally be fired when she got married. Even a woman with a college degree likely made less than a man with a high-school diploma. "When you think about it from a guy's perspective, marriage wasn't such a great deal," says Richard Fry of the Pew Research Center. "It raised a household size, but it didn't bring in a lot more income." Four decades later, it's men who are reaping rewards from a stroll down the aisle. Many more women are now working, and in a greater variety of jobs. Add to that the decline of gender discrimination, and women's median wages have risen sharply in recent decades even as men's have remained stagnant or fallen. On top of this — for the first time ever among those age 44 and younger --- more women than men have college degrees. The Pew study also finds that the more educated you are, the more likely you are to be married. It didn't used to be that way. It's all turned the marriage market on its head. "We found that increasingly, women are more likely to marry husbands who have lower education levels than they do, and lower income levels than they do," says D'Vera Cohn of the Pew Research Center. 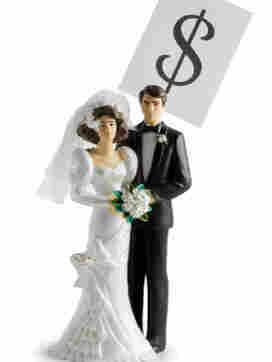 From 1970 to 2007, husbands whose wives earned more than they did jumped from 4 percent to 22 percent. That comes as no surprise to Derek Monnig, whose wife earns about double what he does. "Well, she gets called Sugar Mama quite often," he jokes. Monnig and his wife are in their early 40s and work at the same telecommunications firm in Denver. She's two levels up the management chain, and Monnig says he would have been too intimidated to ask her out, but a colleague set them up. Six years into marriage, he says he's fine with the income disparity. In fact, three of his wife's brothers are in the same position. We found that increasingly, women are more likely to marry husbands who have lower education levels than they do and lower income levels than they do. "It's kind of a joke," he says. "We laugh about it when we get together. And it's kind of nice to be supported!" Still, pop culture can seem stuck in the 1970s. If you've seen the recently released movie Up in the Air, you saw female lead Vera Farmiga telling a younger woman all the attributes of the ideal mate, including: "Oh, please let him earn more money than I do. You may not understand that now, but believe me, you will one day. Otherwise, that's a recipe for disaster." "I think this is really an example of an outdated idea," says Stephanie Coontz, author of Marriage: A History. Coontz says that in a 1967 poll, two-thirds of women said they'd consider marrying a man they did not love if he had good earnings potential. "Now, women have a completely different point of view," Coontz says. "They say overwhelmingly — 87 percent — that it's more important to have a man who can communicate well, who can be intimate and who will share the housework than to have someone who makes more money than you do." Yet even some housework-sharing husbands are having trouble with this new economic order. "The tension really surrounds this notion of, 'I'm the man, so I should be providing,' " says Steven Holmes, a freelance photographer in Northern California. He makes far less than his wife, a business adviser for IBM, and often finds himself holding back in discussions about spending money. "Because I have this guilt that I feel like I am not an equal partner," Holmes says, "I will let her make the decision, even though I might have had a different opinion." In Fort Lauderdale, Shelly Murray used to rely on her husband's income when she was in law school and he was working in the health and fitness industry. She admits she had no problem dipping into their joint banking account. But it's not the same for her husband now that she's a lawyer and the tables are turned. "When there's some kind of a stress in the relationship," Murray says, "even something peripheral that has nothing to do with money, [the disparity in income] will come up in the conversation." Marriage expert Coontz says no one should exaggerate women's new economic prowess. They still make 77 cents to a man's dollar, and their earnings can lag over time since women are more likely to cut back to care for children. But this, too, is shifting. In Denver, Monnig and his wife have started talking about having kids. "Making less, I would be the one to stay at home," Monnig says with a laugh. "We've already decided that." Monnig says his wife would love to be a full-time mom. But financially speaking, that just wouldn't make sense. When it comes to marriage, education didn't use to matter. In 1970, across all education levels, roughly the same proportion of people got married — about 82 percent of women and 87 percent of men. But as Americans as a whole have become better educated and as overall marriage rates have declined, a significant gap has emerged. Today, among U.S.-born 30- to 44-year-olds, the more educated you are, the more likely you are to be married. It's a slightly different story for blacks. Black wives have long been more likely than whites to be in the labor force. Already in 1970, black women faced a marriage gap: Those with college degrees were more likely to be married. That remains true today. But as the Pew report notes, marriage overall has declined more sharply among African-Americans than the population as a whole.